In addition to the crucial role they play in protecting the value of your home, window wells have a variety of other advantages. When coupled with a high-quality, UV-treated window well cover, like our heavy-duty Lexan (TM) polycarbonate covers, they bring clear natural light into your home. They’re also an important safety measure in case of fire or other emergencies. Install our deluxe plastic composite window wells near Naperville, IL, and you’ll have a life-saving escape route. They’ve got built-in steps as part of their attractive stacked stone finish, and they’re sturdy enough not to shift or buckle, no matter what the weather throws at them. 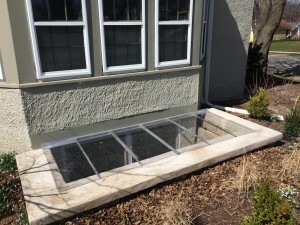 Call Window Well Experts for expert advice on your window well needs, as well as a free estimate. Galvanized steel window wells near Naperville, IL are a popular choice for anyone looking to secure their basement windows. These cost-effective and durable wells have a number of advantages. Their zinc coating makes them virtually rustproof, their seamless construction prevents leaks, and they’re almost invulnerable to bending and shifting if properly installed. At Window Well Experts, we’ve got expert technicians who can do the job, but all our wells come with pre-drilled holes for fasteners, making this an easy do-it-yourself job. We manufacture our wells themselves, so we can guarantee their high quality, and they come in dozens of heights and widths. With shapes ranging from square to round, you’re sure to find a well that fits your property perfectly. A good window well can beautify your basement, both by allowing natural light in and with a variety of aesthetically pleasing finish options. One of the most popular choices is white window wells near Naperville, IL. With all the durability of our galvanized steel window wells plus a bright white finish, these high-quality window wells will give your basement a pristine modern look, and because they’re so easy to clean, they’ll stay white for years to come. At Window Well Experts, we even sell white egress ladders to match your well, combining safety with design.